Version 2.14 of the IECHost GUI client is now available within my Software page. 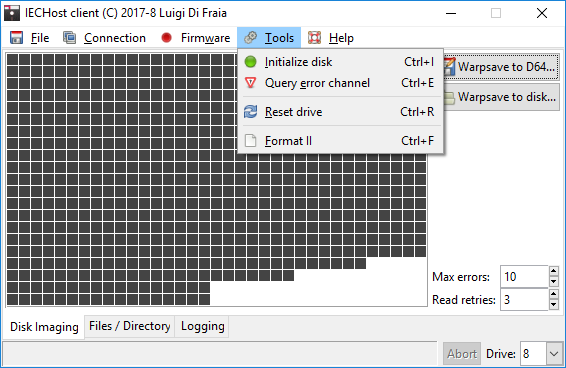 Before you crack on with disk imaging, be reminded that this version requires a firmware update in order to use custom disk name and ID to format disks using “Format II” routines (fast format). Over the weekend I stumbled over what I’d refer to as an incomplete implementation of the logic within the IECHost GUI client when sector retry attempts are exhausted for a track. The consequence of this bug is that in presence of tracks with lots of errors, a track change would have been missed by the GUI. Version 2.13 of the client is now available within my Software page. More binaries were published for Raspberry Pi 3 Model B within my Software page, including all Integrator 2012 bundles! 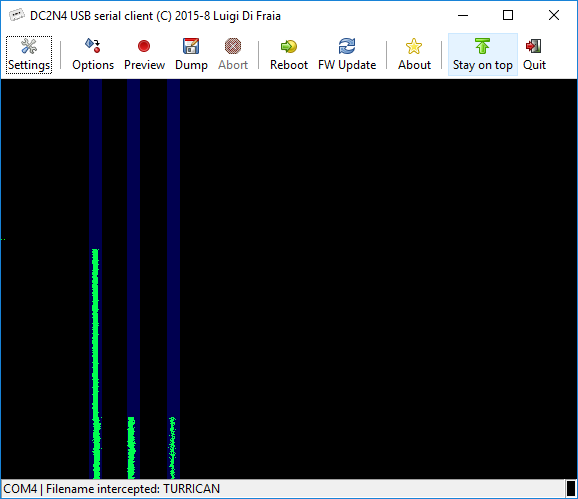 Version 4.3 binaries of the DC2N4-LC multi-threaded GUI client were published within my Software page. Within the same Software page I also published version 1.1 binaries of my filename extractors. I also wrote a gist that uses the CBM ROM filename extractor in order to append the name of the first CBM ROM file found in each TAP file to the TAP filename itself. 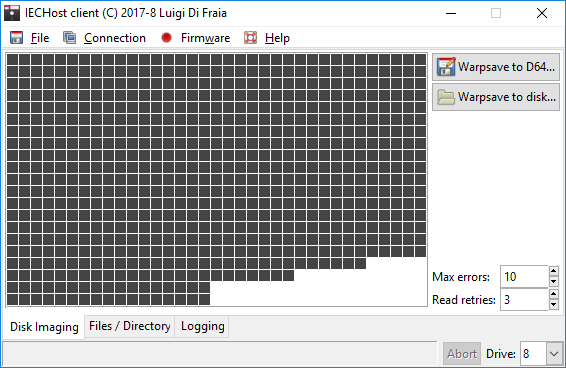 It requires a bash equivalent under Windows. If you have Git installed, you can use Git Bash. 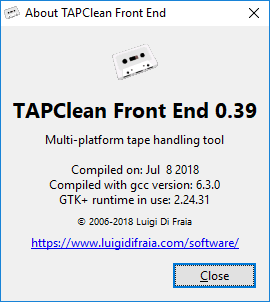 Following the release of TAPClean 0.37, I managed to also prepare updated Linux and Windows packages for TAPClean Front End, which include release binaries of TAPClean too. You can get the update from my Software page. 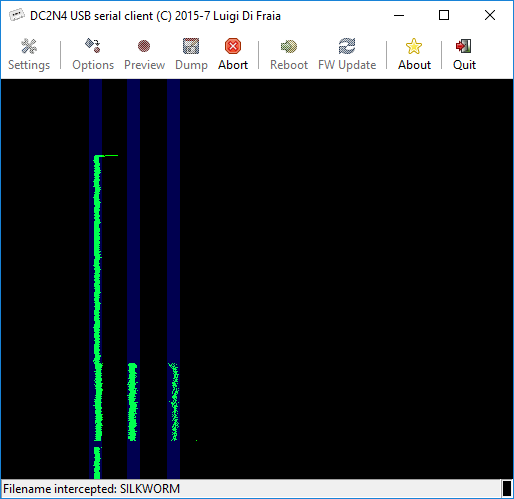 Version 2.10 of the IECHost GUI client and version 4.2 of the DC2N4-LC multi-threaded client were published within my Software page. Please be advised that a number of features in the recently introduced Tools menu require a firmware update, which can be performed through either client software once the device and bootloader ports are both discovered correctly, as per IECHost manual. 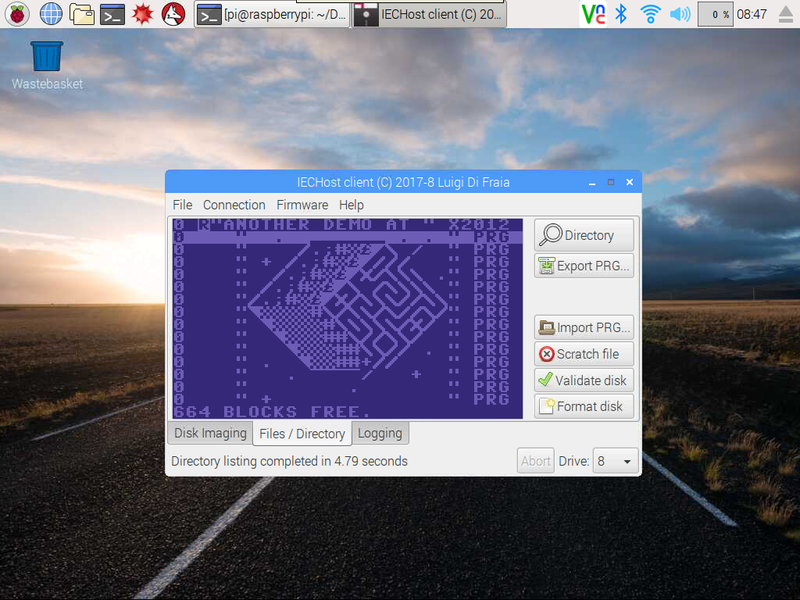 Version 2.7 of the IECHost GUI client for Raspberry Pi 3 Model B was published within my Software page. New IECHost client published for Windows and Linux! Version 2.7 of the IECHost GUI client was published within my Software page. Also available at the same page is version 1.5 of the IECHost utilities (iechost-utils) package for command-line usage.